On Wednesday, April 10, we concluded our regular Wednesday night programming for the year! We had an awesome year together studying and connecting with God’s Word. The Picture Smart Bible gave us a bird’s eye view of each book of the Bible. This year we studied the following divisions of the Bible: Old Testament—Law, History; New Testament—Gospels, History. Every week, we learned the highlights from each book—main characters, interesting stories, and how each book ties into the overall story of Scripture. The kids learned that the Bible definitely isn’t boring and it’s not too hard for them to understand. One of our goals on Wednesday nights was to encourage kids to memorize the books of the Bible because when you have even basic knowledge of where to find each book, it doesn’t feel as overwhelming to open the Bible to study it on your own. 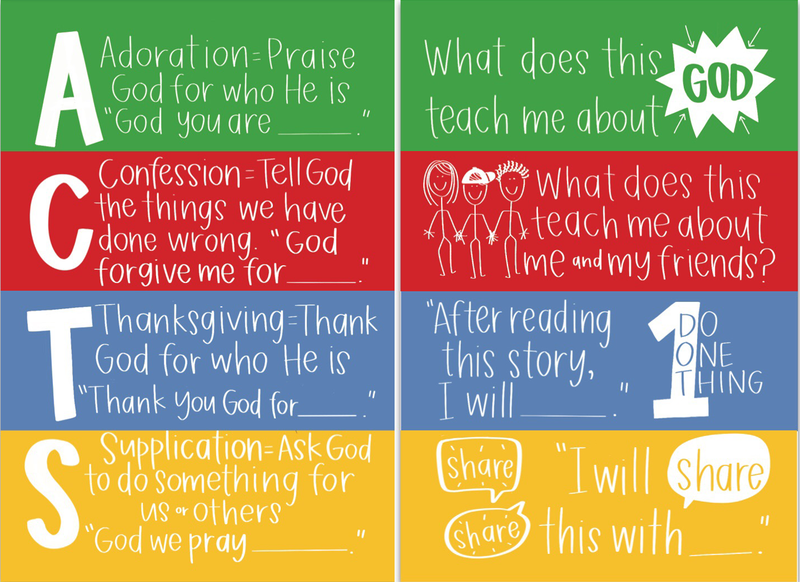 In addition to memorizing the books of the Bible, we worked on learning one thing about God’s character from each book. For example, when we studied Genesis, we taught the kids the following phrase and a motion to help them remember it: “In Genesis, God is Creator.” God is certainly Creator all through Scripture but remembering that phrase helps the kids recall an important truth from Genesis. Sometimes, the phrase and motion would help when studying books like Leviticus, which sometimes seem obscure and irrelevant. “In Leviticus, God is the Great High Priest.” This truth reminds us that the book of Leviticus is full of instructions from God to the priests about sacrifices. The struggle with the book of Leviticus is that kids don’t understand why that’s important to them. After all, we don’t offer sacrifices anymore. So, we were able to point kids to Hebrews 7:27 where we learn that Jesus was the perfect sacrifice, and because of Him, we no longer make sacrifices for our sins. He took care of our sin once and for all. Wednesday nights are our mid-week connection point with kids (Kindergarten-5th Grade). Using a variety of learning methods (including art, recreation, snacks, small groups, etc. ), we focus on building Biblical literacy. Biblical literacy is the ability to use and understand the Bible, comprehend the message of Scripture, and apply biblical truth to one’s life. Perhaps cultivating literacy sounds a bit daunting, but intentional practice in age-appropriate ways over the course of a child’s development can help kids master these skills. In time, this steady, intentional practice will be well worth the effort. Every week, kids have the opportunity to earn Joy Bucks and shop in our THF Kids Store. Click here to see all the ways kids can earn Joy Bucks this semester. We believe God desires to speak to everyone through His Word. In order to encourage kids to interact with Scripture and develop the habit of spending time with God outside of church, every Wednesday we send home a “Diving Deeper” devotion.